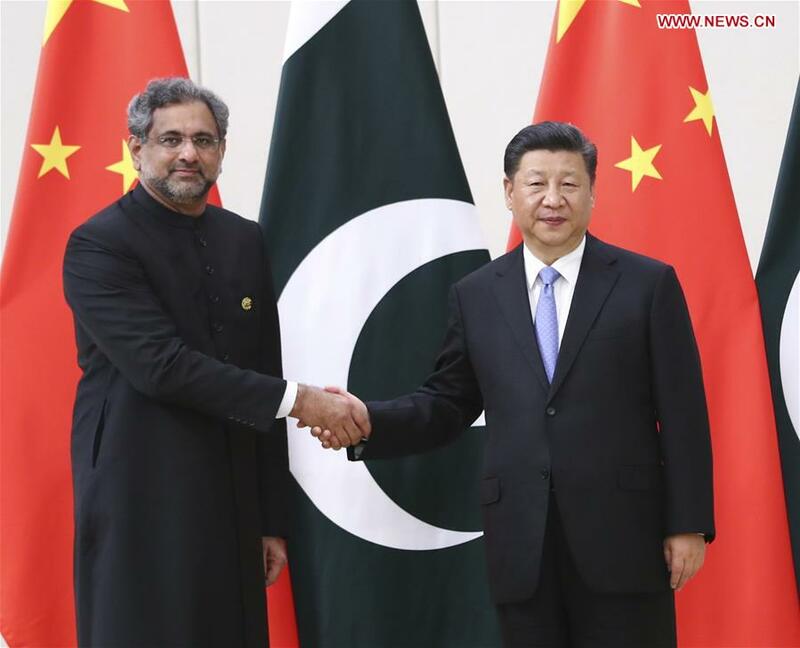 BOAO, Hainan, April 10 (Xinhua) -- China-Pakistan relations should be a pillar for regional peace and stability, Chinese President Xi Jinping said Tuesday when meeting with Pakistani Prime Minister Shahid Khaqan Abbasi during the Boao Forum for Asia annual conference. The ties between the two countries should become a model for good-neighborly relationship and international cooperation under the Belt and Road Initiative, Xi said. "The China-Pakistan all-weather strategic cooperative partnership has made outstanding progress since I visited Pakistan in 2015," Xi said. The international and regional situation is undergoing profound and complex changes, which makes it more important for the two countries to consolidate the all-weather friendship and deepen strategic cooperation, the president said. China is willing to make joint efforts with Pakistan to push bilateral ties to a higher level and build a more closely-knitted community with a shared future between the two countries, Xi said. Xi called for efforts from both sides to advance the construction of the China-Pakistan Economic Corridor (CPEC), and ensure the sound planning and implementation of cooperation projects involving infrastructure construction, such as the Gwadar Port, as well as energy and industrial parks. What China most wants to see is stable development and prosperity in Pakistan, Xi said. China firmly supports Pakistan in its efforts to safeguard sovereignty, territorial integrity, and legitimate rights and interests. China opposes interference from any country in Pakistan's internal affairs, and firmly supports Pakistan in maintaining its national unity and the fight against terrorism, the president said. For his part, Abbasi said China and Pakistan are "iron friends" who always support each other on issues involving each other's core interests and major concerns. Hailing CPEC's important role in the development of both countries and the region, he expressed Pakistan's willingness to promote bilateral cooperation in finance, energy, agriculture, infrastructure and human resources. After their meeting, the two leaders witnessed the signing of bilateral cooperation documents.